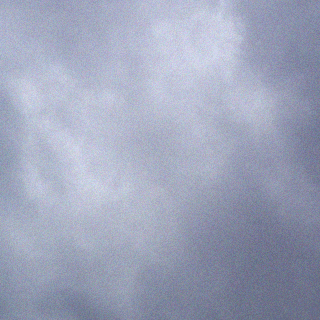 Good readers, it’s time for a Show and Crow. Not of my work but that of a couple of my students. I just wrapped up a landscape quilt design class today at Pioneer Quilts; this was a two part class I called ‘From Photo to Fabric’. Students brought a landscape photo and from it created a pattern for a quilt. The class was small – three students – but that did give them room to spread out plus more one-on-one time with me. Two of the students got about halfway done with their quilts and kudos to them, the quilts are looking FANTASTIC!. I just had to share these with you. I took photos of their quilts in progress with their original source photos included so you can see what they have achieved so far and also the final goal. 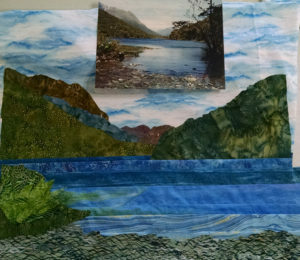 Jill’s quilt features a lake (or river?) in New Zealand in a technique I call ‘Striplique’, a blending of strip piecing and applique. The strip piecing is ideal for water features and meadows. She still has to add the tree silhouetted on the right and plans to use a confetti technique to render the lacy details on the tree. She may add some stones fussy cut from a landscape fabric on the shoreline. Charlotte chose a rural landscape with a rusty farm gate on a gravel road with a meadow and trees against a backdrop of hills. She also plans to render the tree that will be positioned on the right hand side of her picture in fabric confetti and used the strip piecing to create the layers of meadow grasses in the middle ground; she also was intrigued by a technique I showed of insetting strips of fringed raw edged fabric between the strip pieced seams to make three dimensional rafts of grasses for an ethereal, airy look and texture. She plans to add the rustic gate with stuffed bias bars applied after the rest of the landscape is completed. I have included a closer view highlighting the frayed fabric grasses on her quilt. 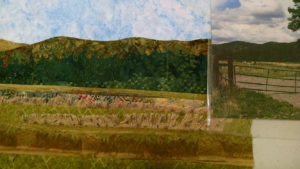 Charlotte’s landscape close-up to show the frayed three dimensional grasses. 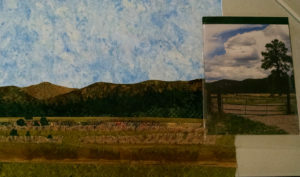 The third student is making a view of the Columbia River gorge with the Vista House on a nearby hill and Beacon Rock off in the distance; the foreground will be a riot of foliage and flowers. She was newer to quilt making and got most of her background pieces prepared with adhesive and ready to fuse but did not get far enough along for a meaningful photograph. All three have promised me photos of their finished projects and I hope to show those in a future post.